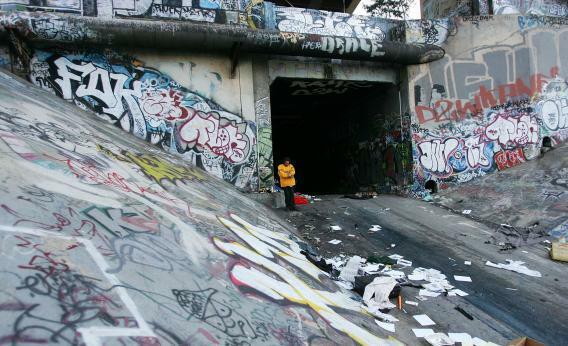 Where Is the Best Graffiti and Street Art in Los Angeles? If you look, there’s a wealth of art to be found in out-of-the-way nooks and crannies of any large city. But L.A.’s rich gang and hip-hop history combined with the sheer amount of raw, underused urban landscape make the city an especially rich hunting ground. You could split street art into two categories: legal and illegal. The illegal kind thrives in the industrial landscape of the city, but it’s usually quickly repainted, so there aren’t really fixed places to see it. Because it’s also in hard-to-access locations, finding it is an exercise in wandering and paying attention to your environment. Start from downtown and go north, east or south—if you keep your eyes peeled as you explore these more run-down areas, you’ll frequently stumble onto an abandoned lot or a grimy dead-end street positively bursting with color and life. Nowadays, graffiti on the river is much harder to find as the city spends millions of dollars a year repainting it to concrete gray—a pretty pointless effort if you ask me, considering it’s largely invisible to anyone except graffiti enthusiasts and urban explorers. If you’re feeling adventurous, you can find one of many broken fences and make your way down to the river. The areas around bridges frequently have clusters of tags (along with the occasional homeless encampment—don’t go alone, but don’t be afraid; they’re nice people). The legal kind of graffiti—murals and designated open walls—can be found all over the city, on everything from humble South Central convenience stores trying to stop illegal tagging to hip Melrose shops jostling for street cred. The best place to see high-quality murals is the L.A. Arts District—an area both physically and metaphorically on the crest between the up-and-coming downtown and the no man’s land around the river. It’s got an amazing concentration of open walls and pieces from some of the most famous street artists in the world. While I find the idea of designating a neighborhood as an officially sanctioned and sandboxed “arts district” a bit questionable—shouldn’t art be everywhere?—it’s also a great example of how street art can make a previously run-down urban landscape feel vibrant and alive. When is graffiti not a crime? What is Banksy’s greatest work of art/graffiti and why? What is the best way to learn how to illustrate?